Pit bull terriers in Florida can look forward to a brighter future due to a recent case in Gadsden County. When the Community Animal Assistance department at Best Friends got word that there were dogs in need due to a recent seizure in a rural Florida community, they immediately got the ball rolling. Best Friends convinced county officials to evaluate for the first time the behavior of dogs seized in a dogfighting bust by the Gadsden County Sheriff's Office for possible placement. Best Friends then coordinated the effort to put a team together for the health and behavioral evaluations. Lamb Chop, Shari Lewis, Hush Puppy and Charley Horse are four pups that are on their way to much better lives thanks to this collaboration. They represent the littlest victims in animal abuse. Born to most likely be abused like their seized brethren, the fast-acting teamwork of some of animal welfare's most dedicated individuals and groups were able to get these youngsters out of the shelter and into a foster home filled with loving care. "We are ecstatic that some of the victims of cruelty have the chance of finding a loving home instead of being summarily euthanized," said Ledy VanKavage, senior legislative attorney for Best Friends. "We appreciate the county officials willingness to do right by the dogs." This establishes a precedent in the Sunshine State of addressing the needs of such dogs as victims of cruelty and abuse, rather than deeming them dangerous and unadoptable. Nearly three dozen dogs were transferred by the Sheriff's Office to the Gadsden Animal Control facility, where they were assessed by Dr. Laura A. Andersen and Dr. Cate McManus of the University of Florida Maddie's Shelter Medicine program. First-year veterinary student Alana Canupp assisted the vets in their evaluation and treatment of the dogs. Their diligent work paved the way for a court order to legally transfer control of the dogs away from their owner, due to evidence of poor care. Best Friends recruited Tim Racer of BAD RAP (Bay Area Doglovers Responsible About Pit bulls) to conduct behavioral assessments of the dogs. With the assistance of veterinary technicians Kelly Bigsby and Christina Seghi of Hillsborough County Animal Control, Racer looked at the dogs' reactions to various stimuli. Several dogs turned out to be loving, happy, and social dogs - quite different from the widespread public perception of dogs seized from fighting facilities. Everyone involved agreed that the key to success in this instance was the cooperation of all groups and organizations involved. Dr. McManus cited this collaboration as one of the most positive aspects of the case. "It was great to see different groups coming together to care for these animals and ensure their humane treatment," said Dr. McManus. Dr. Andersen concurred: "The interagency cooperation worked very well." The commitment of Dr. McManus and Dr. Andersen have far exceeded the assessment event, together they have tag-teamed fostering Lamb Chop and his littermates. 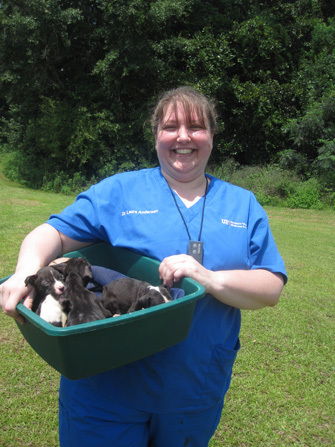 Dr. McManus took these four tiny puppies home to make sure they received the proper care that they would need. They are just a few weeks old and they need fairly keen supervision - which they received as members of the bathtub puppy club! Dr. McManus was scheduled to travel for work and Dr. Andersen stepped in to take over the fostering duties. Dr. Andersen related why this whole endeavor is so important to her: "I personally have an interest in investigating animal cruelty and especially how it relates back to "The Link" [how animal abuse can easily translate to domestic violence and other types of neglect, abuse and violence]. The scientific community has historically not acknowledged that validity - it"s a hard topic to evaluate in a scientific approach and it"s an all encompassing issue. That"s why I feel it"s so important to help however I can in this situation, I"m really glad we had this opportunity to go in and get these dogs out!" Named because he makes sounds just like a sheep, Lamb Chop, was in critical condition when they first got him home. But the good news is he has rebounded to become a healthy and active pup. Actually the tiny Lamb Chop has been eating like a little pig, as have all the puppies, another testament to what what teamwork can accomplish in saving even the must vulnerable of lives. While at Dr. McManus's house, the bathtub puppy club got an unexpected visitor - a foster kitten! The four puppies were outmatched by one orange tabby. "Watching these puppies play with the kitten just dispels so much of the falsehoods that have been put forth [in the media] - these puppies are not exhibiting any traits of a dog bred for certain characteristics. It"s apparent that these puppies are just like any other puppies," shared Dr. Andersen. In the coming weeks, the dogs will continue to receive monitored care and medical treatment as it is deemed necessary. Then, they will be transferred to rescue groups which have stepped forward, including Animal Farm Foundation in New York, A Rotta Love Plus in Minnesota, The Sula Foundation in Louisiana, and BAD RAP in California. As Dr. McManus concluded, "this sends a message that we are not going to tolerate such abuse." Beyond helping these canine victims get out of this situation, Gadsden County is also looking towards improving the conditions of their facility and the way all animals entering their facility are treated. There is a lot of room for improvement in this rural shelter with meager means, and the University of Florida has offered guidelines to help them make progressive strides towards a time of no more homeless pets.